Not many of us can afford a Darrin and certainly not a collection of them. But there's hope for we less affluent types. There are many very collectible toy Darrins. An article by Lynn Zettlemoyer in the Quarterly Magazine of the KFOCI back in 1973 (Quarterly, Spring 1973, pp 15-25) covered models of K-F cars in general and specifically mentioned one model of the Darrin produced by Premier and a metal toy version with remote control. Lynn discovered this last one after he had already done research and written the story--it was included as a separate item on the inside back cover. In the last few months Ben Walker has encountered a number of new models and some new versions of the old ones as well. And like Lynn he too had a last minute surprise! 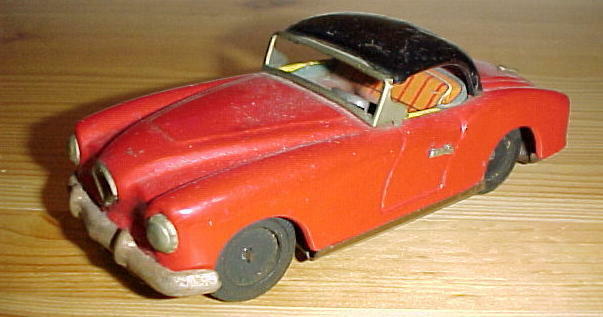 click for 19K pic This is an unbuilt Premier model of the Darrin. The built length is about 7 inches. This one is molded in a light yellow color and the wheels appear to be covered with protective paper. Ben Walker found this one still in the original box at ebay. Ask him sometime to tell you the story about how in a stroke of good fortune he got this kit and three additional Premier kits for about what the Darrin kit usually goes for. 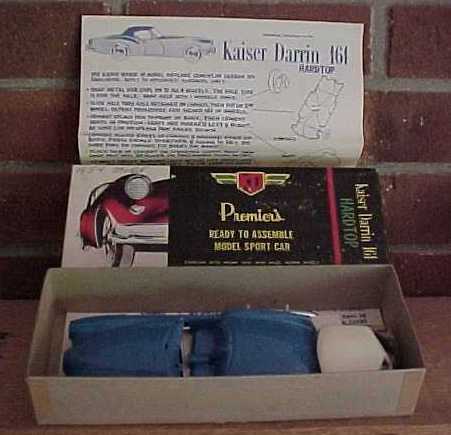 This is the box the Premier Kaiser Darrin came in. Ben Walker was surprised to find another version of this model on ebay recently. It is called a "hardtop Darrin" and came with a top. It was molded in a different color and the box was different as well. 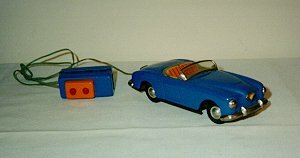 This is an example of the remote control Darrin toy mentioned above. These came in several colors including blue, red and green. And as we will see there are a number of versions of this 6 inch car. There is no larger version of this picture as it was lifted from an ebay ad. This is a green version of the remote control car. Note it apparently came directly from a kid's sandpile (no Ben did not steal it!) The remote control wire broke off the first time Ben fondled it. No identification is located anywhere on these toys to show the manufacturer. click for 28K pic Here is another version of the same basic car. No evidence that this one ever had the remote control and it is obviously in much nicer condition than the green one. Strangely, the little man driver has no arms. Guess this is OK since the steering wheel is just painted on the dash. click for 31K pic Here is a much larger scale model (measures just over 8 inches) from Ichiko of Japan. This one is really well-preserved except for a slight bend in the windshield post. These are evidently much more difficult to find than those in the smaller size. Lynn Zettlemoyer sent Ben a copy of a page from Antique Toy World (November 1997)showing a picture of one of these. The picture caption notes they "are almost as rare as the real cars." The car is pictured on page 66 and appears to have a "replacement" windshield with no frame. Here's another of the Ichiko toys in a different color. Note the missing rear hubcap and the slot behind the seats. I'm not sure if that indicates a top was once fitted or if it has something to do with the "motor." 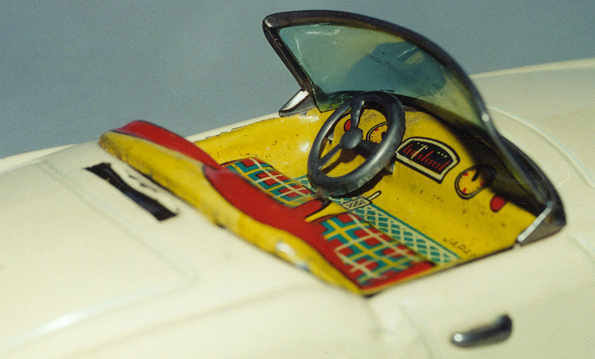 click for 21K pic This view shows the cockpit with painted instruments and gear shift lever. Note the slot referred to above. All illustrations, except as noted, are from Ben Walker's collection. Ben used an Olympus OM1 (mounted on a good tripod) with Zuiko macro lens, flash and Kodak Gold ASA 100 film. He borrowed the lens but he is now in the market for one as this is the only way to get good pictures of models such as these. The photographs were scanned into PhotoImpact 4.2 where they were converted to JPEG format for the web.